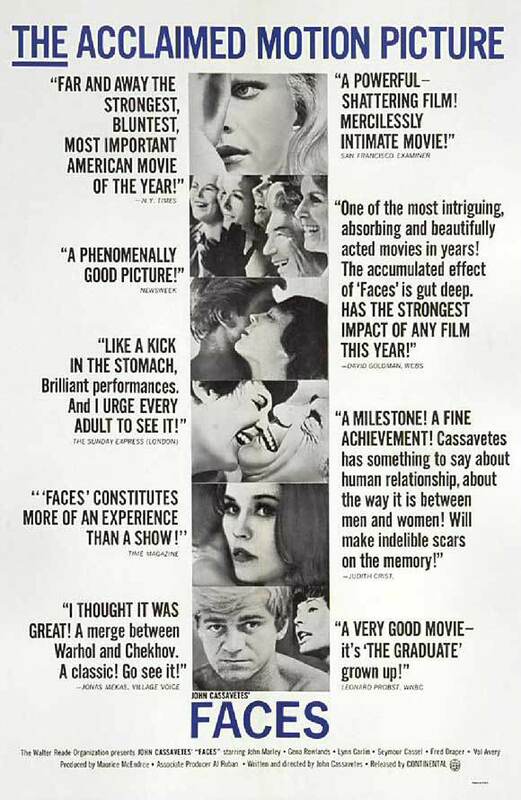 Faces is a 1968 drama film, written and directed by John Cassavetes and starring John Marley, Cassavetes' wife Gena Rowlands, Fred Draper, Seymour Cassel and Lynn Carlin. Both Cassel and Carlin received Academy Award nominations for this film. Cassavetes was nominated for the Academy Award for Best Original Screenplay for Faces. The film was shot in high contrast 16 mm black and white film stock. In 2011, it was added to the National Film Registry of the Library of Congress. The Registry called the film "an example of cinematic excess" whose extended confrontations revealed "emotions and relations of power between men and women that rarely emerge in more conventionally structured films". 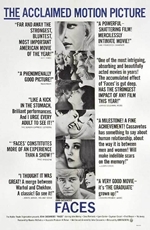 Faces, and other Cassavetes projects, had significant creative impact on Woody Allen and Robert Altman.